You’ve already read the headline: The ‘Goblin Update’ will go live next week! Break out your heater shields, dust off your helmets, bid your savegames farewell and get ready for the big update. 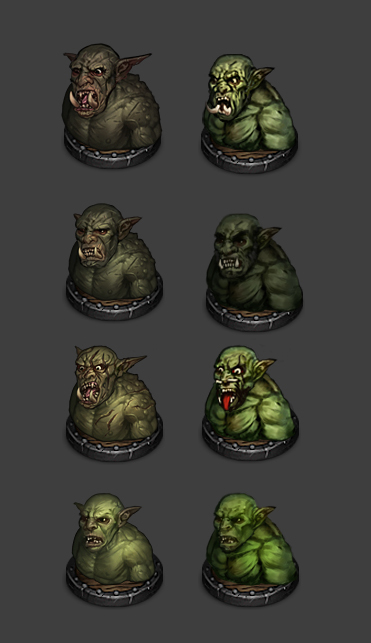 With the Goblins all new and shiny, and getting all the attention, Orcs have gotten green with envy. We can’t have that, so we’ve taken them to the makeover booth for the most exciting visual rework yet. If everything goes according to plan, by the end of next week you’ll get your hands on the biggest update we’ve done so far and can try out all the changes and additions since our last update a month ago. Although we keep calling it the ‘Goblin Update’ there is a heap of new features, items, balancing adjustments and more coming with the update in addition to adding a new faction to the game. Battle Brothers will definitely play and feel differently and we are looking forward to your feedback on all the changes and additions we have made. There’ll be a full faction reveal blog post about the Goblins sometime next week in which we explain the lore of the Goblins as well as their individual units, weapons and fighting abilities in detail so you can get in the right mood. Just to remind everyone: The coming update will break compatibility with your current save games! We’re pretty satisfied with how Orcs feel in the game overall. They have a clear identity as reckless and ferocious melee combatants who overwhelm the player with pure physical strength and wreak havoc in any battle line. Orcs come off as intimidating and brutal opponents, and fighting them feels quite different from fighting other opponents in the game. Their visual design makes up to no small part their identity in the world of Battle Brothers, so that’s what we’ve been taking a look at this week with our continuous efforts to overhaul all the older assets. Since those original Orcs visuals were really beginning to show their age, they’ve been completely redone from the ground up. Take a look at the comparison to see how the new Orcs are much more detailed looking. As we’ve previously established about Orcs in the world of Battle Brothers, their skin gets darker the older they become, which is why Young Orcs have the fairest skin. However, in order to give all the Orcs a more coherent look we’ve adjusted their skin colors to be a bit closer together. We’ve also darkened the color palette slightly and tilted it more into an olive hue to better support the menacing look we’re going for, especially with the Young Orcs who previously could turn out quite bright. The faces you see are just some of several different ones available for every type of unit! The look of weapons and armor is also something we want to take full advantage of in making every faction feel unique and less generic. If you read up on the lore of Orcs you’ll learn that they live in largely nomadic tribes and support themselves by hunting, gathering and taking from others. They possess no knowledge of mining or agriculture, and while they know how to craft metal, they’re not particularly skilled at it, which is why their creations are crude and unwieldy. Orcs already wield those large and heavy weapons that match their physique, but we wanted to really give them a unique armor style as well that is in line with their lore of having limited access to metal and not being able to process it properly. Young Orcs make up the backbone of Orc society, as Orcs usually don’t have a high life expectancy but are quite reproductive. Their armor now has a more tribal and improvised look than before, and is largely made from resources that Orcs have the means to produce themselves in abundance – a variety of animal hides and bones. To round things up, we’ve also added two new lower tier weapons – the Tree Limb and the Cudgel – for their use. Berserkers are Orcs that put themselves into a battle frenzy by taking drugs or hypnosis – and some of them are just straight up crazy. They can occasionally be found wandering alone on what could be described as pilgrimages to slay particularly dangerous beasts. If they succeed, they may wear parts of the slain beast as decoration, possibly also in the belief that it confers powers to them. Their armor is therefore made up of various bone elements from their victims. Orc Warriors are seasoned fighters, as evident from their darker skin color and collection of scars. Years of gathering spoils from raids and battle have allowed them to loot all kinds of armor, break it apart and assemble it into one huge abomination for themselves that actually fits their massive and coarse bodies. As you can see, their armor is made up of various pieces of human equipment, like a helmet’s facemask, a piece of chainmail or a split kettle hat. It’s as much protection in battle as it is a collection of trophies from their past victories. For the finishing touch, ears, fingers and sometimes whole heads are also quite popular. 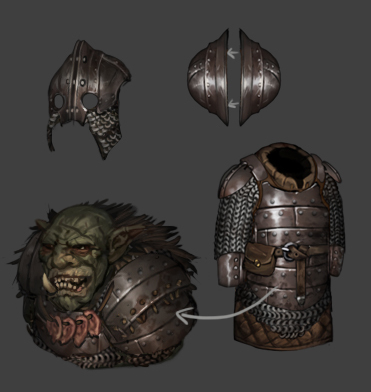 With the new armor style we’re confident that Orcs now have an even stronger identity in the game, one very much distinct from other factions. The many different looks of armor and different faces now available should also add lot of visual variety to the Orc battle lines that was previously missing. Great news on the update! I have to admit, though, I liked the bright orcs. It made them stand out more. They’re now getting the gritty-treatment as well… how unfortunate, at least for my tastes. They do objectively look good, however. Only exception: I really preferred the old Orc berserker. It was very iconic and both sort-of funny and dreadful at the same moment. The tonge, makeup and bones stood out more on the old model. Now they’re harder to distinguish, and you can’t see the terrible berserker right at first glance. I think the bright colours and higher contrast really fit the berserker’s role/gameplay. Personally I like the darker tones of the new orcs as I feel it fits in with the of the world more. I’m also pleased with how they look larger than the previous orcs. The new orc armor looks really cool and I love how its fashioned from human armor and just be crudely broken and rebound to fit them. Its a really nice touch that allows the player to understand the culture of orcs without specifically reading the lore. Good job guys.